Though a dark veil, you see a backlit image of a man with a top hat and walking cane in silhouette. Then a duplicate image of the same man comes into view. There's a scuffle between the two men, one pulls out a sword from his walking cane, and runs the other one through with the blade. 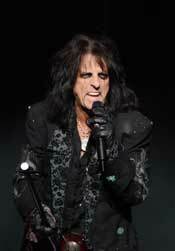 A body falls to the stage floor as the curtain drops to reveal the Alice Cooper, our host for the evening of terror. As the Dr. Jekyll and Mr. Hyde - mostly Hyde - of rock, Cooper takes you on a roller coaster ride through the sins of humanity as one of the original pioneers of Shock Rock. Some contemporary bands that embrace the genre seem to forget that there has to be a build up in scaring the hell out of an audience. Cooper's show is not about gore and garters (though both are present). It's about unceremoniously slipping into madness. The key of Shock Rock is that terror comes out of normalcy, and then takes a turn for the worse. Cooper's decent into madness begins innocently enough when he is pestered by a gal that just won't leave him alone in the song Under My Wheels. Then he is ostracized socially in two of his angry-young-man anthems, No More Mr. Nice Guy and I'm Eighteen. Audiences can relate, or at least know someone similar, to the characters in these songs. By the time Cooper gets to Only Women Bleed, Steven,and Dead Babies he becomes an abusive psychopath with very irresponsible parenting practices right before your eyes. It's a frightening transformation. In support this madness Cooper has employed a killer band that features Keri Kelli (Guitar), Jason Hook (Guitar), Eric Singer (Drums), and Chuck Garric (Bass). Listing all of the bands that they have jointly been a part of would require another article, so look them up! In between Cooper's theatrics the band keeps the live vibe going with rock hard riffs and deep penetrating beats. With a mythical band having his back, Cooper commits multiple murders (simulated of course) and mental mind tricks on stage, much to the audience's delight. Robed figures take away an endless supply of victims in the path of Cooper's fury. Even a recurring female character/ballet dancer, which happens to be Cooper's daughter Calico, is slashed and beaten repeatedly upon stage, and yet she keeps on coming back. I guess that she's as tough as her old man. When the rampage can go no longer his victims rise up and capture him. He is headed for the gallows to pay for all that he has done. Cooper is hanged on stage, very convincingly I might add, and then whisked away while the band rocks on. He returns to the stage in hopes of being Elected, his closing song, so that he can rule this great land and not give a care about its citizens. "A troubled man for troubled times," is his political platform. Remember, Election Day is coming soon, isn't that terrifying. Cooper's music and live show thrives in the fact that he doesn't forget that it is a live performance. If you just want to hear his music, you should stay home with your iPod. An Alice Cooper show pulls you directly into a dark realm and doesn't let go until he's pulled every nightmare out of your demented mind. Shame on you for thinking those thoughts, let Alice Cooper think them. He's been at this for a long time and continues to spread his madness to the masses.